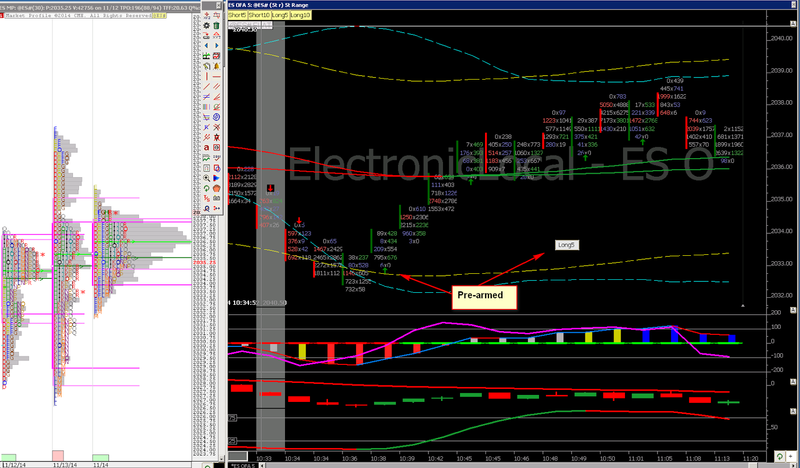 ElectronicLocal: Trading Order Flow. No Optimization! Trading Order Flow. No Optimization! I've finished automating my trading. There's automating and there's automating. I do have fully automated flobots. Their goal is to earn 150% on the set aside capital. However, a competent discretionary trader is able to earn up to 80% a month. How is this huge 80% calculated and proven? And make no mistake, 80% is huge. Lets say a trader has $25,000 in a trading account that is totally risk capital. He's traded in SIM and has become CP. Let's look at the math(s). He trades a 5 lot and averages $1,000 a day nett. $1,000 a day is about $20,000 a month or 80%. Now lets look at how this $1,000 a day can be achieved. The chart below is my trading setup. It is a single bar chart and a Market profile chart. There are buttons along the top left that arm the trades I can put on. I can go Long and Short and I can also reverse a position. You can see arrows appear when a trade is detected. The logic for the trade is pure order flow and is coded into the chart. It doesn't look at all the context. Can't be programmed, at least by anyone I have found. The Market Profile or the new dynamic Market Profile is critical. Its like an F1 driver, when he sees he is on the straight he can put the pedal to the metal but needs to brake when he sees the corner ahead. BTW, an exciting finish to this years F1 in Abu Dhabi next week-end. My favourite car brand will be the winning constructor but which driver? Problem is, if I just run the algo 24/7 the most I can make is probably about $37,000 on my $25,000 capital and I will have a drawdown. And I certainly can't live off $37,000. So I need to approach my executions in a different way. Here it is. Let me be clear. The indicators are context only. No optimization. Just order flow from the volume analysis. The difference between the two chart si the extra button Saying Long5. The buttons on the top left of the chart are just buttons that don't do anything, yet. When I single click on one or more, it "arms" the strategy that then waits for the logic conditions to be fulfilled. I only arm a button when the context is right. 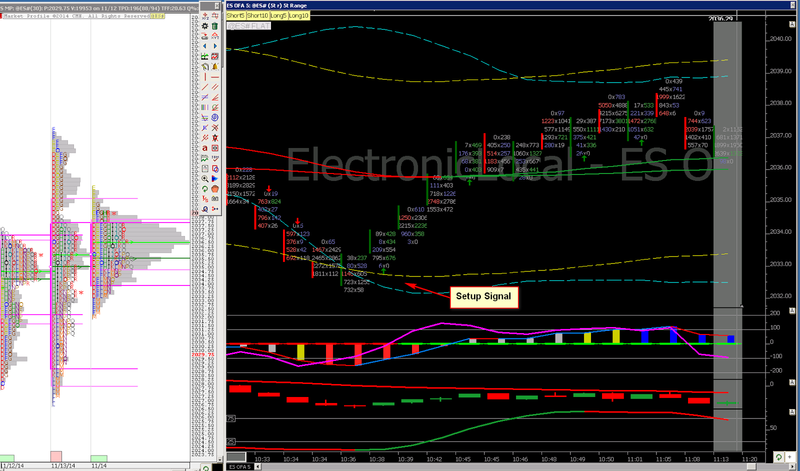 When the trade is triggered, the algo shoots an order to the broker faster than the eye or hand can see it. The platform is also colocated near the broker so that the distance of my workstation in France from the broker does not matter. I'm trading alongside some of the HFTs and use them. The issue with any setup is that one large opposite order can make the trade a loser. By trading with the size I'm reducing the chance of this happening which means my win rate is even higher. All this is in the book. Coming soon. Busy Xmas writing and videoing for me. The maths is simple (approx 4 ES points per day per contract) but the getting to CP is the trick. If you get consistency in a liquid market the sky (nearly) is the limit. Looking forward to the book! And out of the 2 I'd rather Nico won, unlikely as it is. Looking forward to what Ricciardo can do next year if Red Bull improve their car. Looking forward to the book. Can't live off $37K per month? Really?